That's so true... it was one of the strongest moments of raw emotion that I've ever seen on television. Just breathtaking. allegrita wrote: That's so true... it was one of the strongest moments of raw emotion that I've ever seen on television. Just breathtaking. And I do also remember being really shocked that the "reveal" came this early in the season. I'd expected weeks and weeks of will-she-won't-she find out. Talk about intrigued. Love the running commentary... and again Lovebite! Good on your husband for watching with you! I always love hearing how shocked everybody was to see the reveal come so quickly. That had to be a cool moment if you were watching the show in order and in real time. Moonlight being on the CW weekly - at least for now - has been a nice summer treat. I think they have fewer commercials than Sci Fy or Chiller. Even though I have 3 DVDs it is still nice to see the show on TV. I am happy that when Moonlight came out I was a regular viewer of Ghost Whisperer (I haven't watched that since Moonlight was canceled) so that I was able to see the episodes in the correct order the first time around. The amount of advertising CBS did for the show was practically non-existent except for Ghost Whisperer. I was right on time for NSTAV but I remember for some reason I had forgotten to turn the show on for OOTP, and missed the first 20 minutes or so. I did get to see that in a rerun. A couple of things I wondered about last night. When Josef came by in his car, where did Mick's car come from all of a sudden? Also since Mick had blood with him, why did he have to wait until he got back to his apartment to start drinking it? There were a lot of things I loved about last night's episode: the "because I'm a vampire" thought in Mick's head, Beth being so familiar with how to shoot a gun, Josh's comment about since Beth met Mick everything seems crazy, the "don't look at me" scene. redwinter101 wrote: "Please, don't look at me." This is EXACTLY where Moonlight got me. 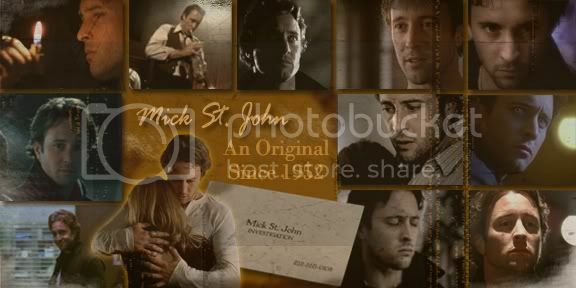 This is where I fell in love with Mick and became an Alex O'Loughlin fan for life. This episode was much better than the first and the more I watched, the more intrigued I became. Then came "...but I was young and stupid back then..." and we swept into the 80's flashback. That gorgeous vampire wearing that arrogant look definitely had me taking a second look - then came the ending and I was lost. An obsession was born with ten words and a look. Alex took a role that could have been excrutiatingly cheesy and turned Mick into something special and unforgettable. That last scene is one of the most captivating things I've ever seen in my life. From Mick desperately trying to get blood into his system, to Beth walking in on him and the way he stiffens up and goes into OMG-mode and him slumping down to the floor and covering himself up to her asking him what he is.....and "I'm a vampire." One of my favorite moments is when he's about to attack Lee Jay and he growls. Ohhhh mama!! Those are the moments you KNOW he's got some animal in him. I love when he's full-on vamp!! For the first time last night, I noticed Mick handing Josef a black bag at the car scene. I assume that was the blood he shoved in a black bag at the FOS because he didn't want it to spoil? Moonlightsonata wrote: A couple of things I wondered about last night. When Josef came by in his car, where did Mick's car come from all of a sudden? Also since Mick had blood with him, why did he have to wait until he got back to his apartment to start drinking it? As for the blood: if you look closely, Mick gives Josef his leather case filled with blood bags, so he didn't have blood with him after he got shot. Thus all the fanfic on the subject of, How did Mick get the blood? I like how you think alle! And that the same moment I was thinking!